The Beginning of a Promising New Season! I enjoyed a busy holiday season filled with good food and time spent with family and friends. Shopping, book signing events and travel filled most of my remaining time and the heart of winter passed quickly, though a nasty battle with that new strain of flu could have passed more quickly. Here in East Tennessee, we had frequent snow with record rainfall during January and February followed with much of the same. 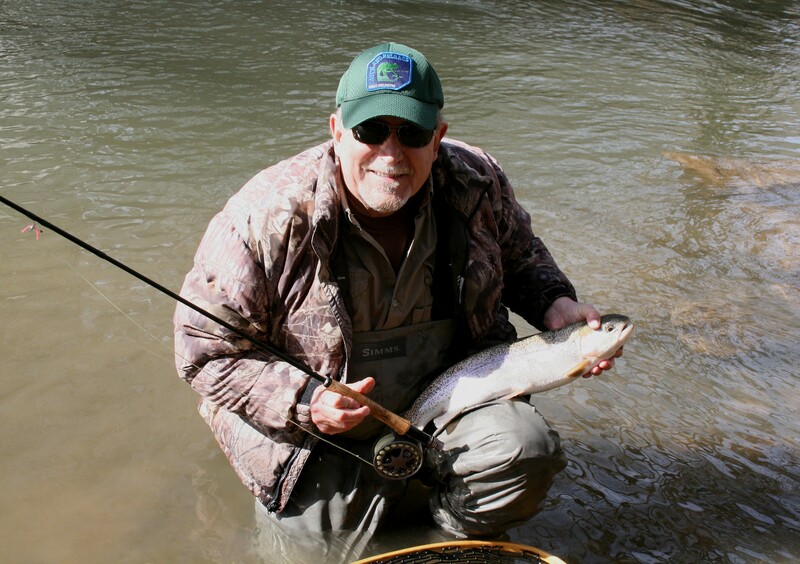 My friends and I enjoyed fine fishing for trout and bass in local rivers and reservoirs before the rain and snow began. But as my schedule filled with Holiday activities, book signings, then midwinter weather restrictions, my time on the water became all too limited. Nevertheless, the many signing events I scheduled kept me from lapsing into fishing withdrawal and provided opportunities to meet many new friends who share my passion for our sport. I enjoyed meeting and talking with them all, from newcomers to seasoned veterans and industry business professionals to fishing celebrities. Also, I was intrigued by many new products I saw including electronics, an array of new lures, other tackle and creative local artwork. However, some people I met left the most memorable impressions. 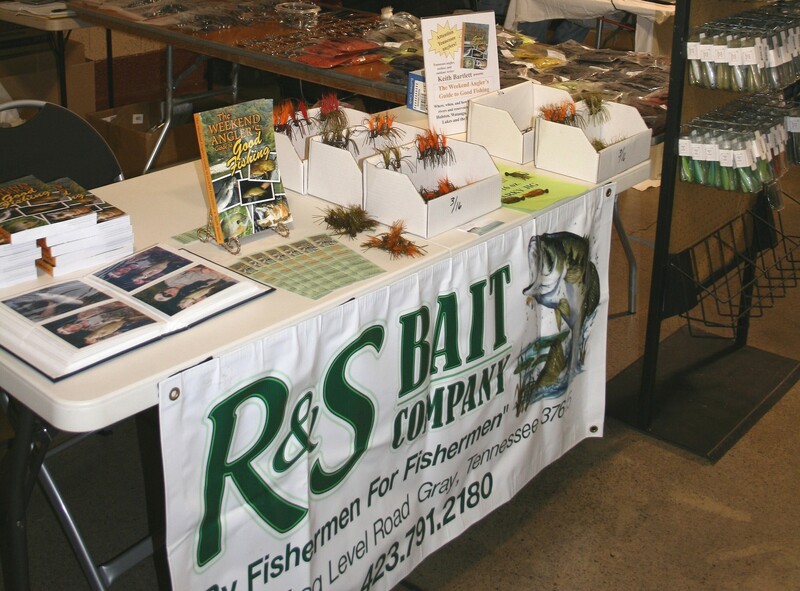 At the East Tennessee Fishing Show with my friends from R&S Bait Company, manufacturers of the best smallmouth bass jigs I’ve ever used. 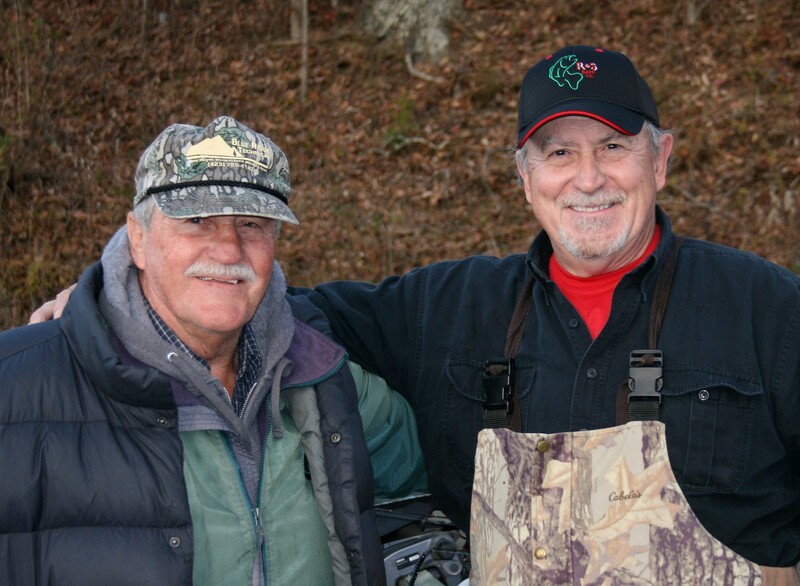 Before the doors opened at the East Tennessee Fishing Show in Knoxville one morning, I bumped into Hank Parker on the show floor as he stood admiring a new boat. I enjoyed the most pleasant, relaxed conversation with him and confirmed he is the likeable down-to-earth gentleman I’d always thought him to be. 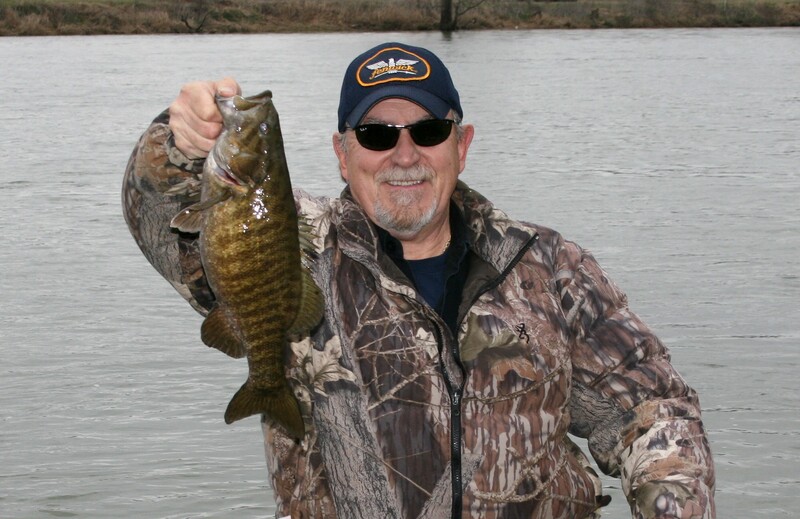 My most surprising encounter began when I got into a lively discussion with a young man, a tournament angler who I did not recognize, about smallmouth bass. He had an obvious out-of-town accent, from Michigan I learned, as we discussed the differences between longer Tennessee smallmouths and the thick-bodied smallmouths found throughout the great lakes. I’m sure he enjoyed our conversation as much as I did, a discussion born from shared admiration for one of North America’s greatest game fish. We talked until he was called away and I was drawn to others waiting to chat. Later, I learned he was Jonathan VanDam, the hottest rising star in professional bass fishing and nephew of all-time money winner and legendary tournament angler Kevin VanDam. I was most entertained by a fellow fishing fanatic I met less than two weeks ago at a boat dealer open house in Morristown, TN. I recognized him immediately because I’d read about his past tournament success with BASS and enjoyed his humorous antics on television. During our conversations that day, I learned that Fish Fishburne and I share a special interest in catching smallmouth bass in rivers. We once cut up like ten-year-olds as we laughed and talked about setting up a trip to run up a local river we’ve both long wanted to fish in my jet-drive G3 boat; a model similar to one he’d recently sold. I hope we make that trip sometime because anyone with that much energy and such a great sense of humor would make an entertaining companion for a day on the water. So it’s not been a boring winter because I’ve been very busy, studied a variety of new angling tools and talked with many experienced anglers. But with the earliest spring flowers blooming and average air temperatures beginning to rise, my mind has shifted back to the sound of water lapping along a shoreline, cool clean air, and the thought of a sudden bend in a fine graphite rod. It’s time to get back on the water and enjoy some good fishing. In the last few weeks, area lakes and streams have started clearing and water generation rates have decreased. Trout are one of my preferred target species throughout the cold-water period and a couple visits to the closest tail-water confirmed they’re adapting well to the clearing conditions. Both rainbow and brown trout remain active in cold winter water though the lowest temperatures of the season reduce movement and feeding. Browns have recently finished spawning and should be feeding more frequently to regain strength and body weight. 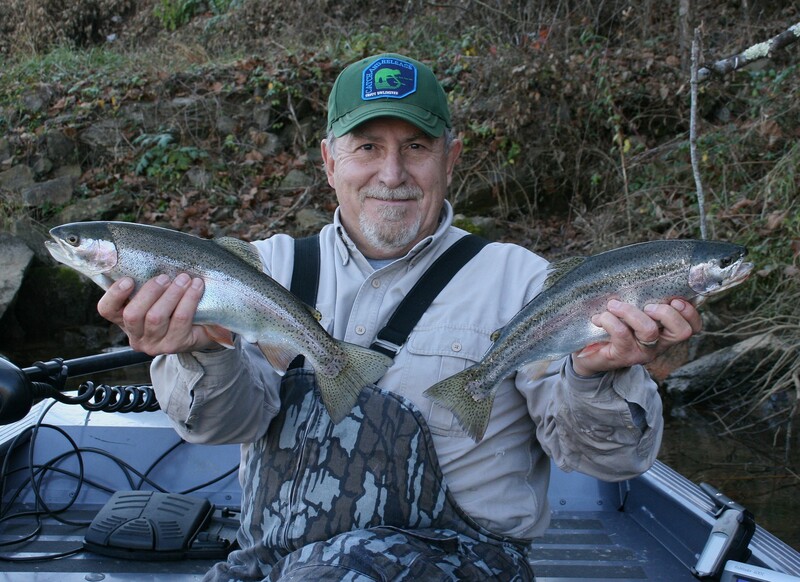 Rainbows are active, will spawn soon and should be at their heaviest weights of the year. However, I found trout fishing a little too slow in the tail-water I checked. There’s no question the recent flooding affected fish location and cold, snow runoff slowed their metabolism but I quickly discovered why they weren’t hitting as well as expected. The winter shad die-off must be peaking because the water I fished was littered with dead and dying shad in various sizes. With so much nutritious food available, trout feed less often because they can quickly fill their stomachs with little effort or movement. I don’t consider that a problem, but a promise of things to come. 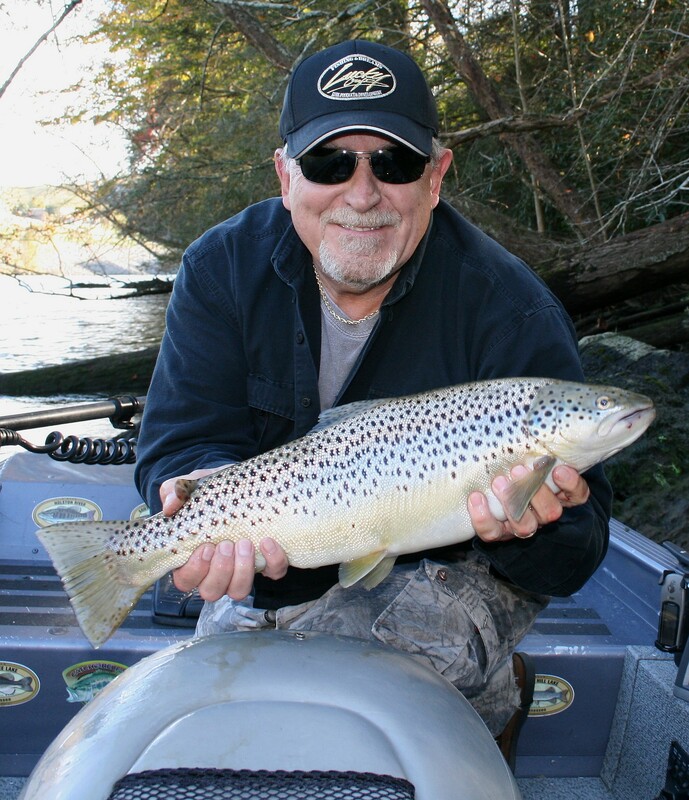 As the shad kill diminishes and the water begins to warm, the trout will continue to focus on that limited but easy to catch source of protein. So, tail-water fishing will soon be excellent for some beautiful pot-bellied trout using shad-imitating lures and I’ll be there to enjoy it. 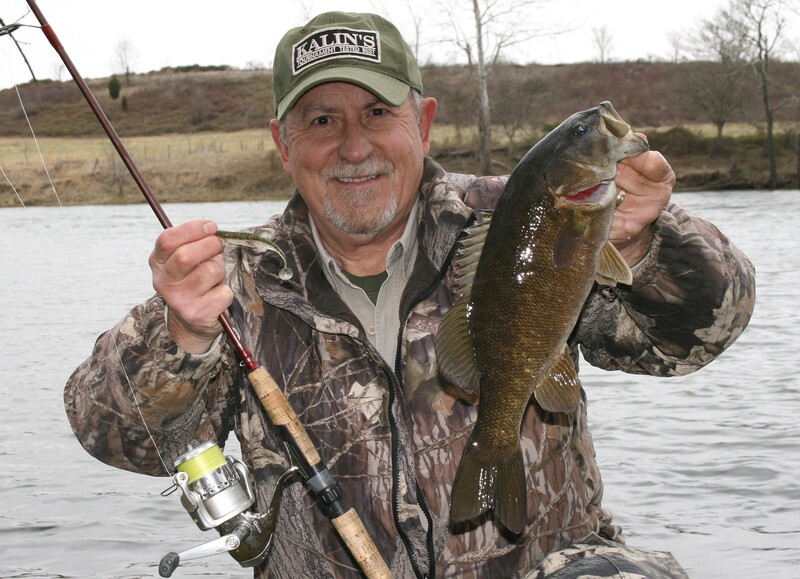 A check of the local smallmouth bass population produced better results. A single trip to a highland reservoir confirmed most smallies there were still deep and suspended. After many hours on classic winter structure I caught only one nice bass on a silver buddy and inquiries at the ramp later confirmed fishing was poor with several zeros reported, though one boat reported a few fish caught on Damiki Rigs in fifty-feet of water. However, the river smallmouths I checked were much more cooperative. I fish for river smallmouths throughout winter, focusing on periods of high flow when they’re pushed to shoreline eddies and easier to find. But with the recent drop in water generation and little rainfall the last two weeks, many of my most productive eddy areas were so shallow I could see bottom. I caught a few bass but concluded they were scattered and holding behind larger scattered structure or in deeper holes, sheltered from the cold, swift current. So I replaced my Texas-rigged soft plastics with something I could fish horizontally to cover water; swimbaits. 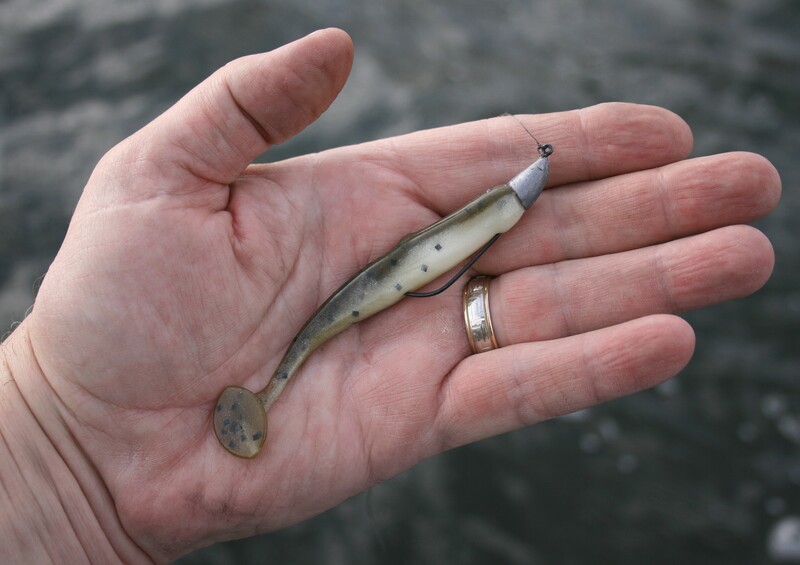 If you’ve read my book, you know I’m a match-the-hatch kind of angler. Therefore, when fishing for smallmouth bass in rivers I prefer long, slender swimbaits that mimic shiner, chub or darter minnows. So I grabbed several packs of skinny swimbaits, hooks and other gear and went to my favorite local river do some testing on a cold, breezy afternoon. Thirteen smallmouths later, I was convinced I’d found the right formula. A few days later, a friend and I caught sixteen more including several two-pound-plus beauties. I’ve tried several brands, sizes and colors of swimbaits in the last two weeks and found the best choices share some common traits. 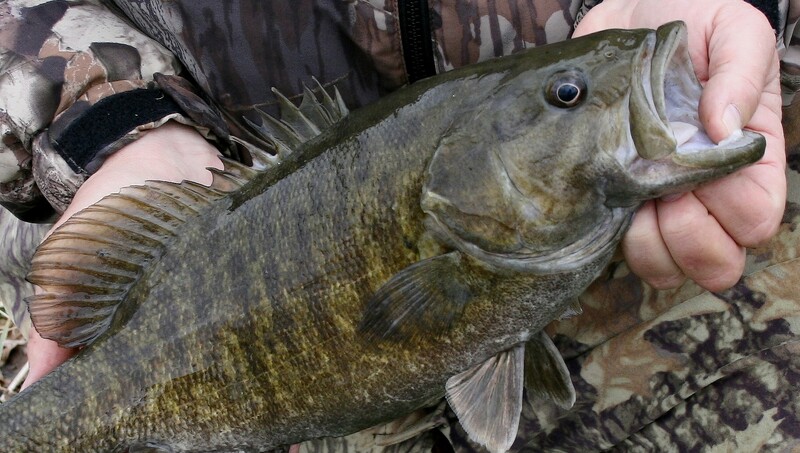 It isn’t necessary to wait for warm weather to catch smallmouth bass in rivers. Combine weedless soft-plastics that match the size, shape and color of native forage with slow presentations and you can catch them throughout winter. This fish and many others were caught on an overcast winter day with frequent sleet and snow squalls. Slender plastics in three-and-three-quarter to four-inch lengths have been equally attractive to smallmouths. Natural minnow colors with grey, light-brown or green backs and white or pearl bellies have all caught fish. Silver, gold or other colors of fleck in the plastic added flash to the bait’s lifelike appearance though I’m not convinced the fish showed a preference. Also, I’ve tried various rigging methods including Owner Ultrahead Bullet Rigs and weighted EWG hooks in 1/16 and 1/8 ounce models and found all equally effective, and weedless, when properly matched to the size plastic used and water depth. I’m sure screw-lock or other similar weighted, weedless hook designs will also work well; I simply haven’t tried them. Finally, I always use an attractant or masking scent when presenting slow-moving plastic lures. When my friend and I went, he used Yum F2 Spray in Shad and I used Berkley Gulp Attractant in Shad, and we each caught eight nice bass. But the most crucial variable common to all the lures we tried and places we fished was the need for a painfully slow, steady retrieve. Get a little excited over the chunky fish you’d just released, increase retrieve speed and you’d quickly go from hero to zero. 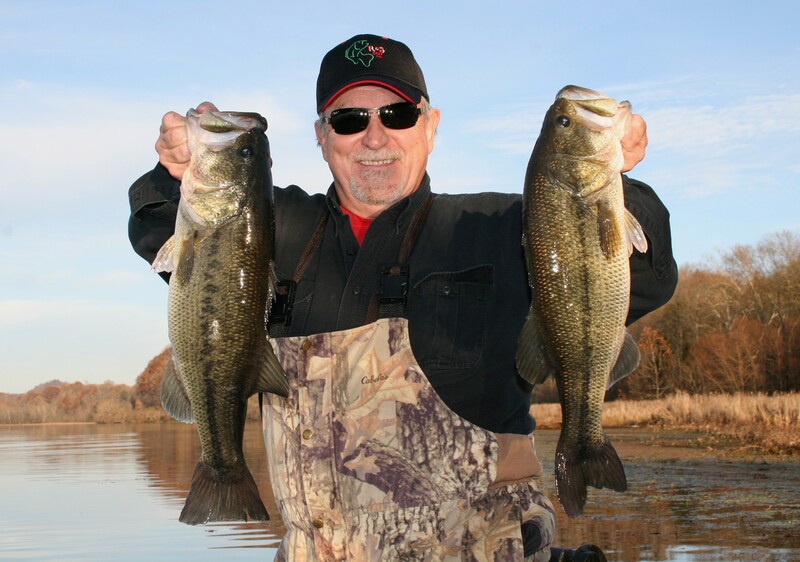 With the proper choice in hook weight, the lure should tap bottom frequently during the retrieve. When the lure starts dragging bottom, lift the rod tip to raise the bait but continue the same slow, steady rate of retrieve. 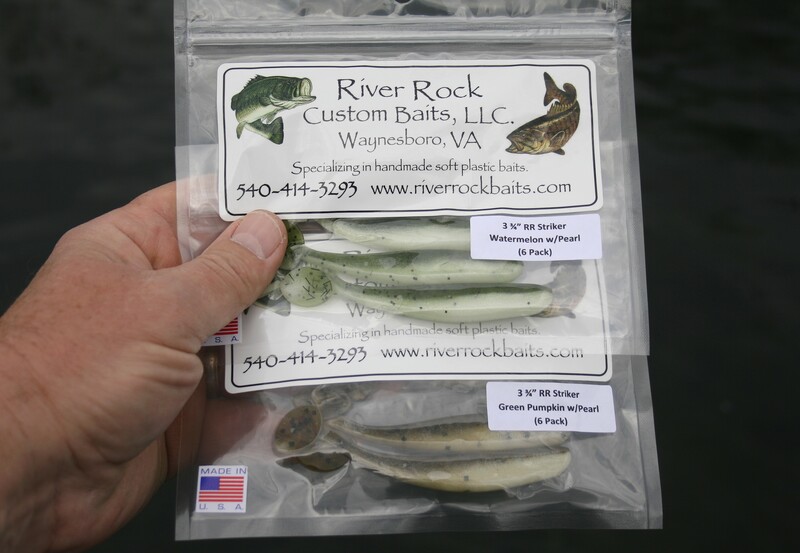 If you live close to a river that offers good smallmouth bass fishing during summer, don’t wait, grab some skinny swimbaits and weedless hooks and go catch some nice fish. 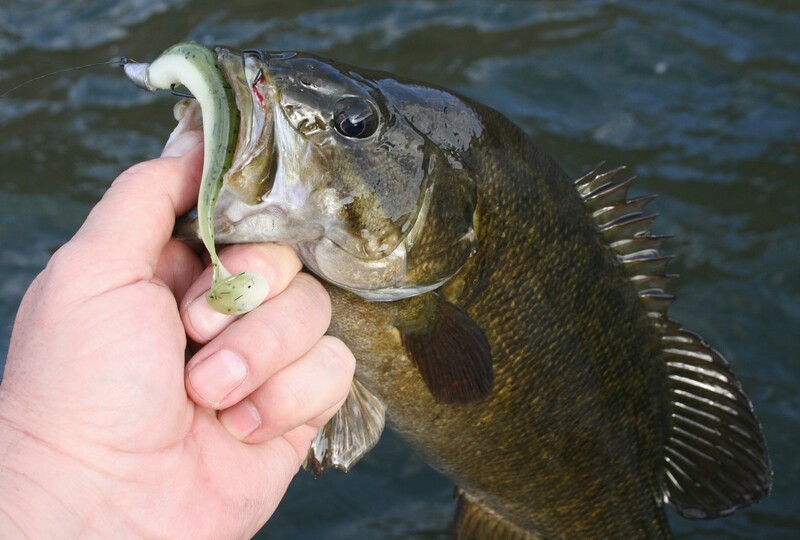 But remember; use a slow and steady retrieve speed to catch river smallmouth bass in cold water. Soon, good fishing will be available everywhere. 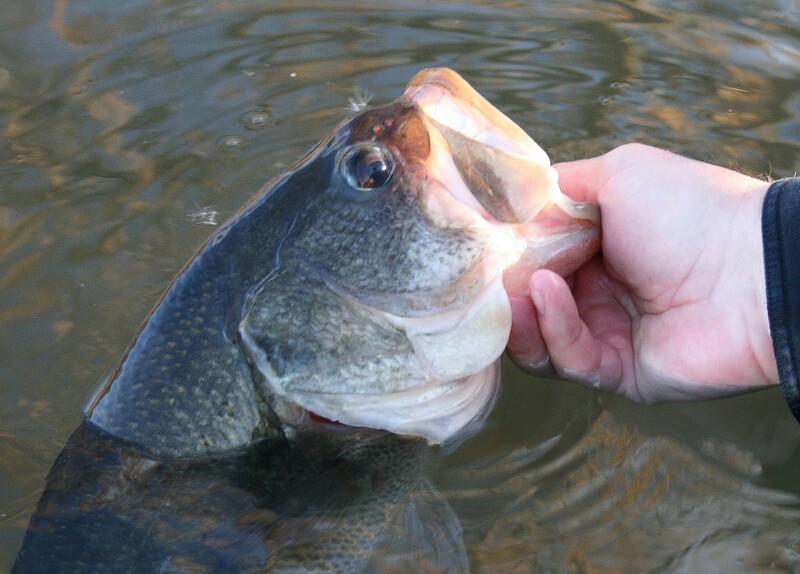 As longer periods of daylight begin warming the shallows, bass and crappie will move to sheltered shorelines to begin their prespawn ritual and offer good fishing. And rivers will soon fill with white, striped bass and other river spawners; walleyes are already there and scheduled next on my list for a visit. So if you haven’t prepared for early-spring fishing, it’s time to get your boat out of storage, spool up with fresh line and get tackle ready to go because we’re about to begin another promising new fishing season! I take pleasure in the additional minutes of sunlight each day brings during winter. The extra fifteen minutes a week becomes noticeable by early February. However, winter is what it is. Each new day promises a few added moments of daylight but is often accompanied by bitterly cold weather and cutting winds. Like all anglers, my available fishing time is not well synchronized with the weather forecast so many times my only choice is to fish when conditions are extreme. Nevertheless, I’ve found a window of opportunity that produces good fishing throughout the cold water period despite the weather. 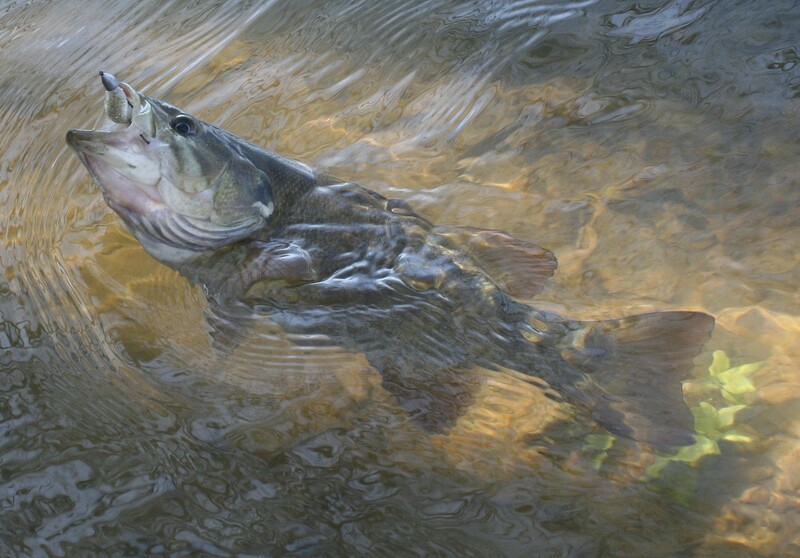 The only condition required to capitalize on it is increased water flow in a river close by that holds smallmouth bass. In the heart of the TVA system where I live, heavy generation from dams is common throughout winter because of increased power demands. 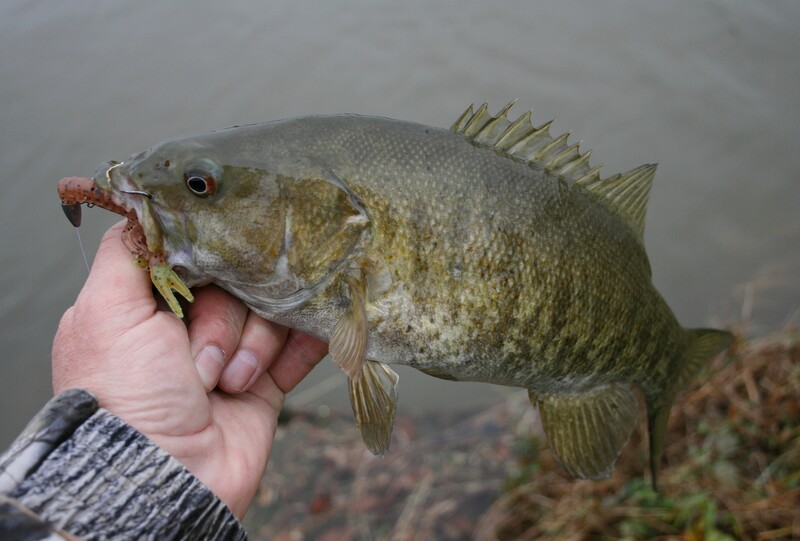 So when generation and water flow increases, despite the weather, I visit a local river to catch a few smallmouth bass. A few hours in the afternoon when temperatures peak is enough to enjoy this fishing experience. If it is cold and windy, add an extra layer of clothing. When it snows, add heavier, waterproof outerwear and boots. But don’t let cold weather stop you if the river is full and running swift, although there is a limit. The river shouldn’t be so high the water is out of the banks; high and swift is ideal, flood stage is not. Good water clarity isn’t crucial although heavily stained water limits the fish’s strike zone and may negatively affect success. 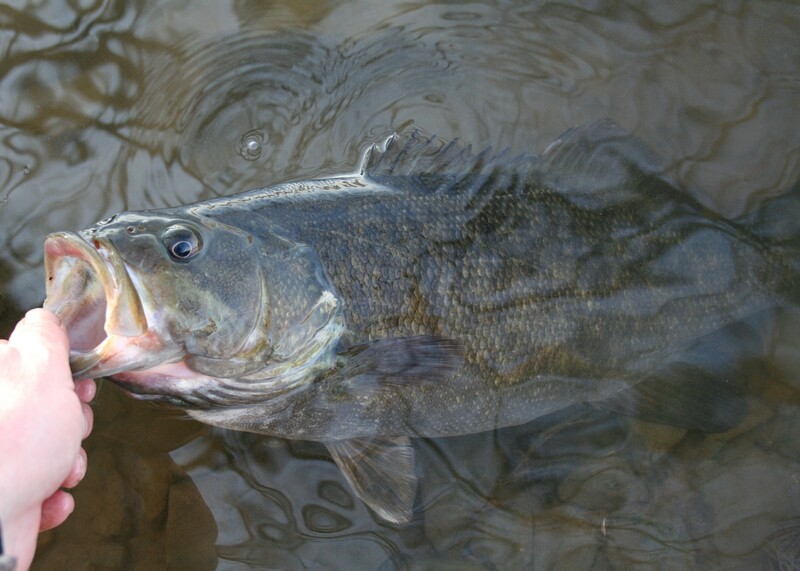 Under high-water conditions, smallmouth bass move out of the cold, swift water to shoreline eddies. Find safe access with secure footing along the shore and you’ll be a short pitch-cast away from some fine fishing. Use weedless lures you can fish slowly through slack water and you can find fish willing to strike. Strikes are often subtle, detected more by line movement than by feel. So cover water slowly and thoroughly as you watch your line. You will be sold on this method of fishing the first time you set the hook, the rod bows, and a big smallmouth bass begins thrashing on the surface. Access to a river is easy to find where walking trails, city parks, and highways are present or permission can be obtained to cross private property. 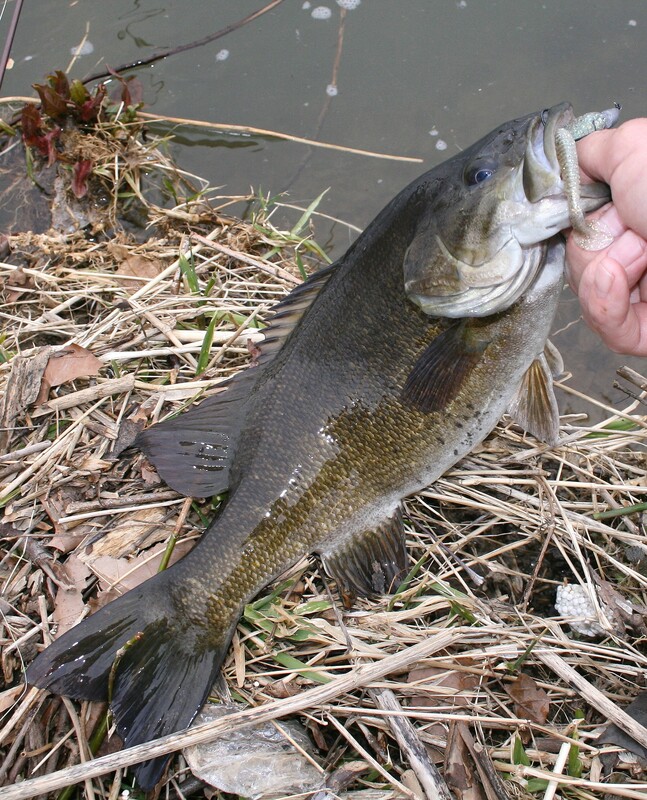 If it’s a river system you fish during warm weather, focus on sections that attract and hold smallmouth bass during summer because many will produce good fishing during winter. I discovered this method of catching smallmouth bass in rivers during winter many years ago. Though I’ve never seen it described in a sporting publication or on television, I have met a few anglers who enjoy catching bass this way. If you live close to a river that holds smallmouth bass and would like to learn more, there’s a feature story in my book in the chapter on winter fishing that describes the tackle, lures, and methods of presentation I employ to catch these great game fish in rivers when the snow begins to fall. If you try it, let me know how you do and anything new you learn because information about his type of fishing is extremely limited. Be safe and great fishing!